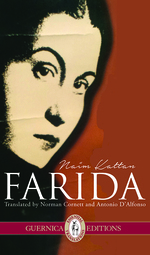 In a recent interview with Stanley Asher of Radio Shalom, principal translator of Naim Kattan’s Farida Norman Cornett speaks about Naim Kattan’s life and literary career, his influence on Canadian literature, and his novel, Farida, which showcases the vibrant, multicultural communities that existed in Baghdad before the Second World War. The english translation of Naim Kattan’s Farida, trans. Norman Cornett and Antonio D’Alfonso, was published by Guernica Editions in Spring 2015. Naim Kattan was born in Baghdad, Iraq in 1928, and left for Paris in 1952 to study at the Sorbonne. He came to Montreal in 1954. Cornett explains Kattan’s unique position as a Canadian writer writing about the Middle East, as he is able to bring with him to the West the perspective from within the jewish Iraqi community. Moreover, Cornett brings up the topic of identity, as it relates to both Naim Kattan’s life and to Farida. Farida surpasses cultural, religious and ethnic boundaries, and as she does so, she proves to be a “vibrant and dynamic” woman. Tagged with Farida, Interview, Naim Kattan, Norman Cornett, Radio Shalom, Stanley Asher.